Celtic moved to the top of the SPL table for the first time this year with an unconvincing victory over Aberdeen. Scott Severin struck both posts with a rasping drive in the fourth minute in a rare Aberdeen foray forward. 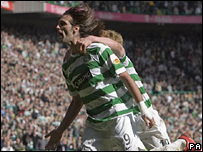 Georgios Samaras rose unchallenged to head home Barry Robson's free-kick after 56 minutes. Zander Diamond's injury-time shot was ruled out for handball as Celtic held on to lead Rangers by two points, having played three games more. Celtic manager Gordon Strachan made four changes to the side that won the last Wednesday's Old Firm game. Bobo Balde replaced the suspended Gary Caldwell to make his first appearance since December. Lee Naylor, Paul Hartley and Jan Vennegoor of Hesselink were all sidelined with knocks and were replaced with Mark Wilson, Massimo Donati and Georgios Samaras. Aberdeen's Jamie Langfield was recalled in goal in place of Derek Soutar. Jeffrey De Visscher, Stewart Duff and Derek Young also started ahead of Jackie McNamara, Sone Aluko and Chris Maguire. Severin almost gave Aberdeen the lead in the fourth minute when his 20-yard drive struck a post before rolling along the line and hitting the other upright. Balde spurned Celtic's best chance in the opening quarter when he stabbed at Andreas Hinkel's cross, but his effort sailed wide. Aberdeen were content to hit Celtic on the break and were camped in their own half for long spells. Paul Caddis replaced Hinkel at the break and his drive on the right-hand side offered some much-needed spark. Shunsuke Nakamura shot wide moments after the break after collecting Mark Wilson's long-throw as Celtic looked to break the deadlock. Samaras, who was having a poor afternoon, had a shot blocked when he could have played in McGeady. Soutar then blocked Scott McDonald's shot as Aberdeen struggled to stem the tide. The Greek international made amends moments later when he rose unchallenged to head home Barry Robson's free-kick. Can Celtic remain top of the SPL? Celtic toiled in their efforts to get a second goal as their laboured passing and slow counter-attacks frustrated the home supporters. Miller almost made Celtic pay when he looked certain to score, but Caddis reacted brilliantly to clear the danger. Langfield then palmed away McDonald's shot from just inside the box and McGeady headed over with the goal at his mercy. Diamond thought he had equalised deep into injury-time, but his effort was chalked off after Barry Nicholson was adjudged to have handled as a nervy Celtic held on for victory. Celtic: Boruc, Hinkel (Caddis 46), Balde, McManus, Wilson, Nakamura, Robson, Donati, McGeady, McDonald (Killen 84), Samaras. Subs Not Used: Mark Brown, McGowan, Sno, Pressley, Mizuno. Aberdeen: Langfield, Maybury, Diamond, Considine, Duff, Nicholson, Young, Severin, De Visscher (Aluko 80), Foster, Miller. Subs Not Used: Soutar, Lovell, Maguire, Bus, Jonathan Smith, Walker. BBC Sport Player Rater man of the match: Aberdeen's Andrew Considine 7.67 (on 90 minutes).